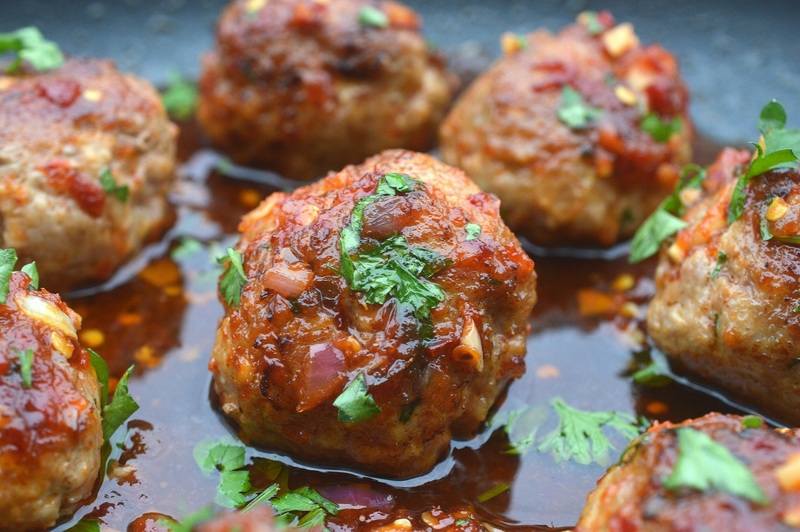 These Asian Pork Meatballs With Ginger Honey Sauce are my favorite meatball to make! They are different and delicious and be default, gluten free too! Love meatballs as much as I do?? If so, this recipe for Asian Pork Meatballs With Ginger Honey Sauce will become a new family staple! If you read Souffle Bombay then you know just how much I love a good meatball! I seriously think I could write a cookbook filled with meatballs or write a song about them and sing it proudly…the second of the two would be easier for sure, I’m one that bursts into random songs quite often and somehow the words just flow…just ask my kids! They say I am like a rapper that way…without the actual rapping skills, one of my few talents haha! I am a little nutty at times! 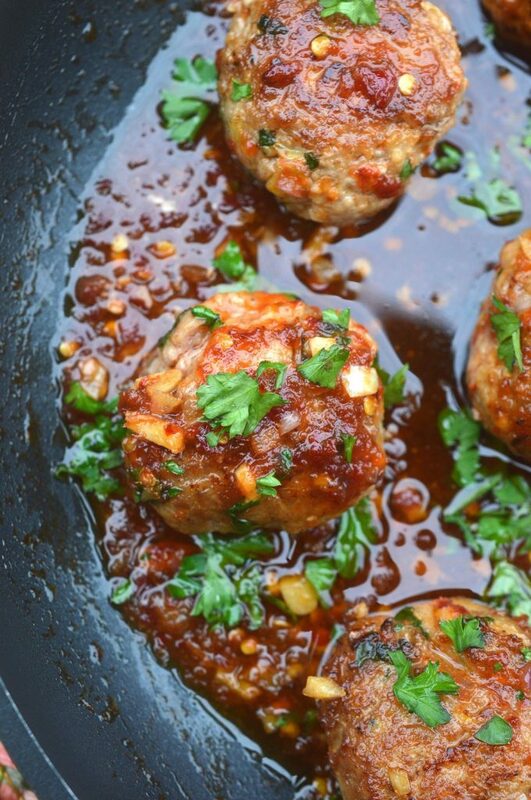 These Asian Pork Meatballs with Ginger Honey Sauce are so…so…SOOO delicious! They’re very flavorful, moist, easy to make and will impress anyone whose palate they cross! Peoples minds get blown every time I bring them places and then within a few weeks, they tell me they made them at home! Love that! 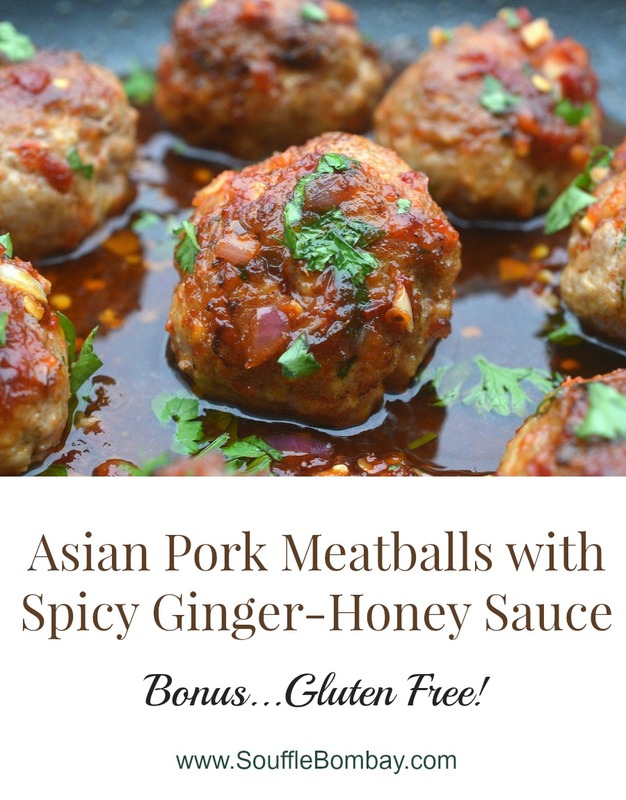 When it comes to pork meatballs, I try to not use any filling and that’s part of the key of why they are so stinkin’ good…in my opinion anyway so because of that, as a bonus these Asian Pork Meatballs With Ginger Honey Sauce are gluten-free! Combine all ingredients together and form balls. They will be wet. It's fine, just get them to hold together. Place on a baking sheet until ready to cook. Use a small amount of olive or grapeseed oil (2-3 TBS or so) to fry the meatballs until nicely browned. Place on a baking sheet and bake another 10 minutes until cooked through. In a frying pan with sides, combine sesame oil, garlic and ginger and saute for 1-2 minutes until fragrant. Add in vinegar, honey and chili with garlic sauce and bring to a boil. Add in cornstarch and whisk until combined and thickened. Taste & adjust. Place meatballs in your pan, coat with sauce, garnish with cilantro leaves (if you like)and serve. Looks delicious! It’s perfect for us that they are gluten free too. Will have to try this soon! Do you serve these with rice or what? You totally could, with Basmati, that would be perfect. We just eat them as is with a salad or on a roll. Or mini as an app. I’m literally obsessed with meatballs of all types! love these!! these look fabulous! I would love to make them smaller as an appetizer for the holidays! Oh gosh, these look SO good! Pass the plate!!! What is the green garnish? cilantro? parsley? Cilantro. I love it….my husband hates it, lol! He can taste a single leaf in something. He has THAT genetic predisposition for sure! me too — was hoping it would be parsley 🙂 To me, cilantro has an “aluminum” taste and I avoid it. We’ll make some with and I’ll pull out a few for myself to make w/o. Thanks! My daughter loves meatballs, hates burgers. I can’t win! But these meatballs would be a great addition to our rotation. MY husband loves the heat, but me not so much. We’d have to compromise on the chili pepper sauce. I made my own out of Anaheim Peppers to knock back the heat but keep that pepper flavor! My kids both love meatballs, but especially when I made it Asian style! These look great, Colleen! I can tell just by looking at them just how delicious your Asian pork meatballs are. I can’t wait to try these and I know my husband will love them too. Pinning! I do love me some meatballs – I have a whole pinterest board dedicated to them (which these are going on)! Awesome flavors in the sauce, too. I do too! I am so checking yours out! If my boys had their way, we’d eat meatballs 3 to 4 times per week. I’m always looking for new ways to prepare them. The garlic ginger sauce sounds so good! I’ll definitely be putting this into the meatball rotation. I may even rap a little myself! I like how they think! And sing it girl! Those look like some of the most flavourful meatballs I’ve ever seen! Awww, thanks!!! They really are delicious! Oh my goodness. I need these in my life, like, now! Drooling! Girl! My husband would devour these! Meatballs are so good when they’re homemade and these look great. That sauce looks perfect too! These meatballs sound delightful! What a great flavor combination. These sound delish! And easy! I like the heat and so does my hubby, extra chili sauce for us! I can’t wait! Thanks!! My kinda taste buds! Enjoy!! This is a seriously amazeball recipe! The sauce is sooooo yummy. I made my balls small for my toddler too. Im going to double the sauce next time! Thank you! So glad you and your family are enjoying the recipe, and yes…the sauce IS good! You could however you may need a bit of a bonding ingredient like some breadcrumbs and maybe 1-2 TBS milk or 1/2 an egg. The pork just gives such an interesting flavor. If you d try it, with beef I’d love to know how it goes. Hi, thank you so much for sharing your recipe. I made these last night and my husband liked them so much and already asked me to make them again. Not only are they tasty but so simply and easy to make. Thank you! Yay!! SO good to hear! Wonderful and yum! Love the addition of orange! These are absolutely delicious!! These have become the most favorite menu at home. Thanks so much for letting me know! Love hearing that! These were awesome! Saved half to let marinade over night in the sauce. Plan to drop them into some gingery garlicky broth with some nappa cabbage and cilantro. Thanks for the recipe. I’d like to make these tomorrow for a party on Friday… Will they be ok to warm and serve the next day? We made these with 2 tablespoons of chili sauce, but the sauce was still lacking heat for our taste. We added a tablespoon of chili paste to it and then they were delicious! They make special skewers, flat, about an inch wide and about 24 inches long with a wooden handle for grilling these on a charcoal BBQ. There is no reason why you could cook your recipe: “ASIAN PORK MEATBALLS WITH GINGER HONEY SAUCE” on these skewers on the barbecue. Depending on how lean the pork is you might want to mix in about 20% minced bacon so they will be nice and juicy and flavorful? Your meat mixture might also be excellent in a Pita Pocket or a Calzone? Mmmm, bacon would be good! I have a recipe on here from Chicken & Bacon Meatballs. I am going to make these as burgers this week. Hoping they come out just as good! Those Kebabs do look good! Like a Lamb Kofta, mmm! Just finished making these, and they are awesome. This is a must try recipe, you will not be disappointed. Thanks Patricia! They are one of my family/friends favorites! How much sauce did you get in the end? I’ve done something wrong because there’s not much sauce to sit them in? I made these delicious morsels this morning using ground chicken. I did need a bit of bread crumbs and 1 egg to hold together but them held nicely. The sauce alone is to die for!! I’m actually scared I’ll become a kitchen slave to make these little gems night after night if I introduce my family to them. There so good. Thanks for the comment! You just might, people ask me to make these often…I actually just turned them into a burger…which you can see here – https://soufflebombay.com/2017/05/asian-burgers-ginger-honey-glaze-burgermonth.html They did not disappoint!! Now I’m hungry just thinking about it, lol! It was very delicious and other than adding chopped water chestnuts, I followed recipe to the letter. I didn’t give it 5 stars b/c of the “messy” factor. Did not like having to pan fry then bake. Can we not skip the pan browning and just bake it longer? I think what gives these pork meatballs such good flavor is the browning from pan frying, that crispness is delicious. I am sure you could simply bake them, I just have not made them that way. if you do try it that way, let me know how they turn out. Thanks for the comment! Hi, can I omit the sesame oil and use just plain oil? You could, it would just lack the flavor that sesame oil imparts. If you do substitute use olive oil or grapeseed oil (not vegetable oil). Hi! Where do I get the ingredient “chili with garlic sauce”? What is that? Hi, I am preparing to make these meatballs. I have everything except the rice wine vinegar. I have red wine vinegar, white vinegar and apple cider vinegar. Would any of these be suitable replacements? Hi Daniel, The white wine vinegar will work just fine. Hope you enjoy! Nice post, very interesting, thank you, james is right http://chefclub.stream has great stuff about asian recipe too but your style is definetely better. Hi they look delicious!-can I substitute the pork for Turkey? But we are paleo.. I would think so, let me know how it goes. I made these for a quick weeknight dinner with rice and steamed broccoli. They were SO good! I will definitely be making them again soon, and will probably even add them into my regular rotation. I’d also like to see if I could tweak the recipe to make a big batch in the crock pot for a crowd. But this recipe is so perfect as written. I was pleasantly surprised with how well these held together with none of the traditional “binding” ingredients I normally see in meatball recipes, like egg or milk. I made your meatballs tonight, they were so yummy. I MADE Indian fry bread, split them, and put the meatball inside, with the sauce. Oh My! I made these today and yum! I served it with fresh green beans and water chestnuts. I would make more sauce next time. These were really yummy. My only complaint is there is not enough sauce. I will double it next time. Glad to year. I double it as well sometimes. Curious why you fry and then bake them. I made them last night~ fried then poured a store bought sauce and done. They were delicious. I like the crisp exterior and then pop them in the oven to make sure they are cooked through. You can also cook them through in the sauce if you make extra. I have not made these with red sauce, glad to hear it tasted good! Thanks for the update!! I’m going to try and make these tonight, however I can’t eat anything spicy. Is there a non spicy substitute I could use in place of the chilli garlic sauce mentioned in the sauce ingredients? I did consider just omitting it, but I don’t know if I could get the same result with a non spicy substitute? Hmmm, you can use less. That way you get the depth of flavor without much heat, Or maybe just use 1 TBS minced garlic mixed with white wine vinegar and a pinch of sugar and salt? That should do it. Yum! You had me at gluten free. I was looking for a pork meat ball recipe to do something with ground black bear. Yes, bear. I was stumped but thought that pork would be a good compliment and I could wrap my head around the idea better. Really tasty. Used 2 pounds of 1:1 mix and upped your ingredients proportionally. Served these at a game night here that also featured venison in a garlic marinade. A little weird for me after decades vegetarian! A package of ground pork from a local farm is thawing for the next batch, bear-free! Really!! I have never tasted bear, and have limited experience with venison (however just had a venison chili that was amazing…mixed with a bit of other meats as well). Thanks for letting me know! What could i use instead of rice wine vinegar? You can use apple cider vinegar or red wine vinegar instead. I made a double batch of these delicious meatballs for a Potluck we attended. Several restaurant owners, one well known chef , two caterers and lots of foodies in attendance. Everyone raved about them. These meatballs were the hit of the day and I was the star of the moment. Great recipe. Didn’t have to add the thickening agent since I used honey from my hives that is thicker and bonded with the other ingredients perfectly. Super great recipe and very easy. Thank you!! Meatballs totally fell apart without some sort of binder to hold them together. A single egg would solve this problem, otherwise it’s a pretty silly oversight. Sorry to hear that, I never use egg with the particular recipe since I don’t use breadcrumbs for this one. The pork is wet enough and holds up well after chilling when gently pan sauteed. You are the first to say they fell didn’t work out. These were excellent and exactly what I was I was looking for for my extra pound of ground pork. I followed the recipe exactly for the meatballs, but realized I was out of chili sauce with garlic, so I had to substitute sriracha for the sauce. Still delicious. Thanks so much! Meatballs are my favorite food. I am always on the lookout for the new recipes to add variety. This will do just fine! I made these tonight and loved them but had something strange happen to my sauce. All ingredients except the oil binded together and formed this weird hard mass. Any idea what went wrong? Thanks so much. That is so odd, I really have no idea. I am assuming no substitutions correct? I have made this many times and never had anything other than a glistening sauce. These are absolutely amazing! I made the recipe to the letter… perfect heat if you like it medium-ish. Great to hear Nanci! They are always a hit when I make them!